I thought it would be fun to have a Trivia Friday….Pass it On! 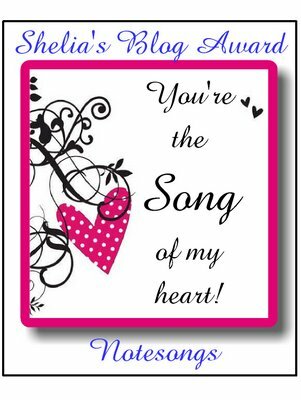 I’ll put your names into a basket and the love bunny will draw a name out of a basket on Monday morning at 10:00 a.m….I’ll post the winner on Monday afternoon when I get home along with pictures. So good luck to everyone for the draw…and have your hand at the trivia. Then I’ll tell you how you did with your answers. 2. Alfred Hitchcock didn’t have a bellybutton. 3. A pack-a-day smoker will lose approximately 2 teeth every 10 yrs. 5. When you sneeze, all bodily functions stop even your heart! 6. Only seven ( 7 ) per cent of the population are lefties. 7. 40 people are sent to the hospital for dog bites every minute. 8. Babies are born without knee caps. They don’t appear until they are 2-6 years old. 9. The average person over fifty will have spent 5 years waiting in lines. 15. 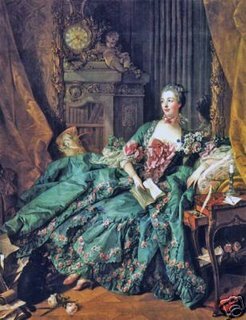 Your feet are bigger in the afternoon than the rest of the day. 18. The only 2 animals that can see behind itself without turning it’s head are the rabbit and the parrot. 19. John Travolta turned down the starring roles in “An Officer and a Gentleman” and “Tootsie”. 20. Michael Jackson owns the rights to the South Carolina State anthem.21. In most television commercials advertising milk, a mixture of white paint and a little thinner is used in place of the milk. 22. Prince Charles and Prince William NEVER travel on the same airplane just in case there is a crash. 24. Most hospitals make money by selling the umbilical cords cut from women who give birth. They are reused in vein transplant surgery. And have a lovely weekend……if you are down here…the comments/questions are on top..sorry but I’m having a slight problem here. Whats in the Left Hand? So…can you guess what I’ve been up to the past couple of days??? 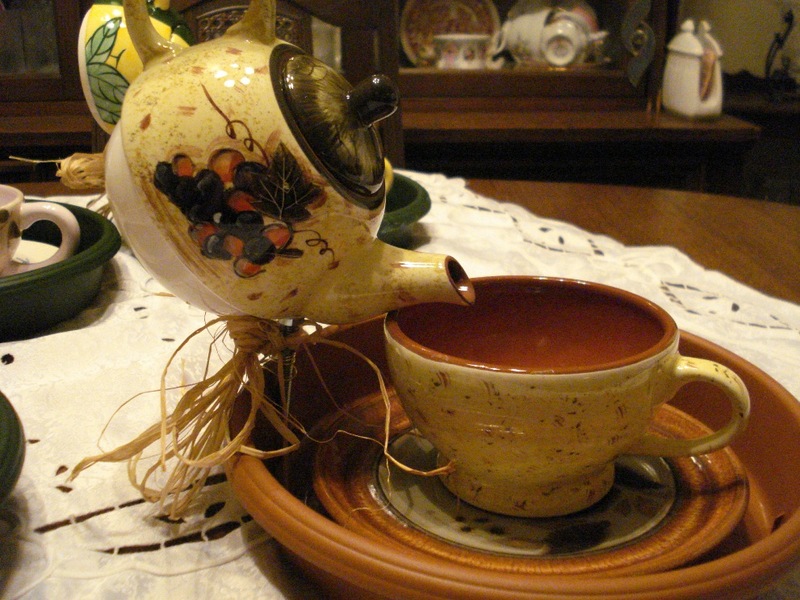 Ladies, lower your spouts up with your handles and the tea time race is on! Thats what these teapot set garden feeders remind me of. While it was so difficult for me to blog and even utter very much in the way of comments because I couldn’t type…it was not so difficult for me to drill with my left hand and so I did! I’ve been happy to have been able to keep thrifting these one cup teapot/teacup sets. I’ve been surprised how these particular items are constantly replenished at the thrift shop. It seems they are wayyy more popular wth me than with people who own them. My best girlfriend and her hubby are taking a 2 week trip from Canada through the States and then eastern Canada. They’ll be spending a night or 2 with us this weekend so I thought I would make one for her belated birthday. So, there’s one for me….. one for my wheelbarrow at Marcs…one for my mother…one for my girlfriend. I just don’t know which one to give her. What do you think? 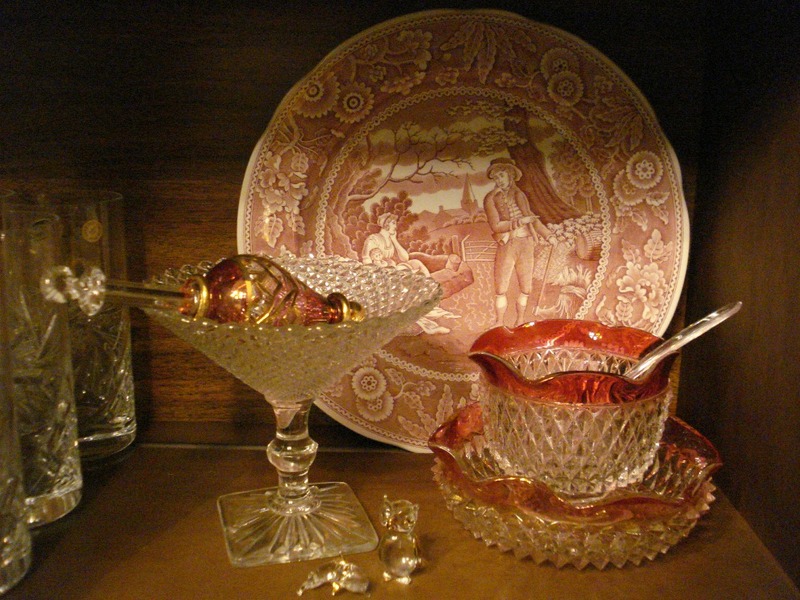 I wanted to show you my cabinet with the ruby band diamond point set, I found while thrifting recently, which is at the front along with a recent ebay Spode plate “Woodman”. A friend gave me the lovely red crystal Christmas tree ornament sitting in the vintage candy dish a few years ago. I treasure it and it hasn’t made it on the tree yet. I hope you have a simply lovely day. Its true we just don’t know how good we have it until something comes up and we don’t! For me it has been my hand…my writing hand..the right one! I haven’t been able to craft, or blog and barely have uttered a comment since Saturday night. oh my. On Saturday I woke up with a sore hand? I didn’t know what I had been up to in my sleep. I don’t remember it bothering me during the day as I drilled my teapot garden party set (you can see Saturday’s post) and whatever else I did. At about 11:00 p.m. the pain started again and my right little finger and side of the hand were soooo tender and sore. By Sunday it was really swollen and I could not dare touch the area. On Monday I went to a walk in clinic during my busy morning at work. I was sent for x-rays but nothing was broken. I had my hand taped with one of those big popsicle sticks and then I was icing it off and on every 1/2 hour or so. Now that was fun to do at my desk at work. Yesterday morning it was a touch swollen and I kept it wrapped to keep from knocking it and I held my hand up. You know, by the end of the day when about the 4,329th person asked me about my hand (all the faculty were back)…I said to a co-worker who sits close to me “I’m sick of this hand story…aren’t you”? We laughed about that. Anyway last night it felt so much better and today the swelling seems slmost all gone but it feels like I’ll have to take care what I do with it. So I am FREE now…and I can type and do all those things I couldn’t that were bugging me. 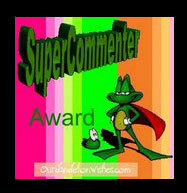 Thinking about not being able to comment or blog much I wanted to send this to you which was forwarded to me. Do any of these sound like you? • Your bookmarks takes 15 minutes to scroll from top to bottom. • You step out of your room and realize that your parents have moved and you don’t have a clue when it happened. • You’ve already visited all the links at Yahoo and you’re halfway through Excite. • You check your mail. It says “no new messages.” So you check it again. A few weeks ago, I turned the volume up on my radio in order to listen to a Saturday morning talk show. I heard an older sounding chap with a golden voice. He was talking about “a thousand marbles” to someone named “Tom.” I was intrigued and sat down to listen to what he had to say. “What brought this on?” she asked with a smile. This certainly is thought provoking and helps to put a perspective on things doesn’t it? I have had a really fun day with me today. It has been a beautiful sunny and hot Saturday and in between working on projects I’ve been out there galavanting First I have finished the Geisha Girl Bag/Tote which is a possible custom order. This is the 2nd one I’ve made and I’ve added some medium weight fleece interfacing. This will help the bag stay upright better and not flop over. She is a pretty lady Michael Miller’s Geisha Girl. I initially did some beading before I started the sewing. It hightlights the ornaments in her hair. 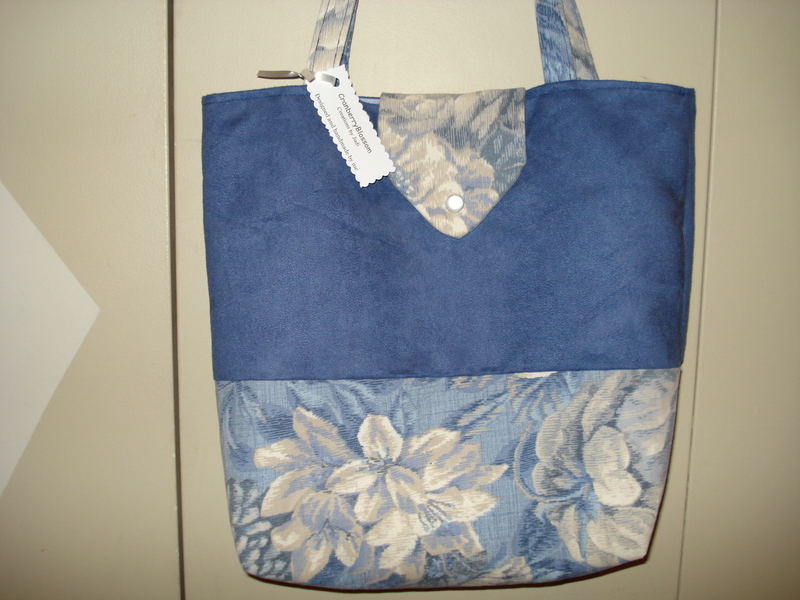 It is a pretty bag, I love the fabric and I’m pleased with the way it turned out. After galavanting outside for a while I decided to tackle Glenda from tootsietime‘s teapot set garden party ornament. I posted about her tutorial last night and thought I might like to try it myself. I gathered up the materials, drill in hand, literally closed my eyes waiting for the teapot to explode into millions of pieces. Guess what? It didn’t. 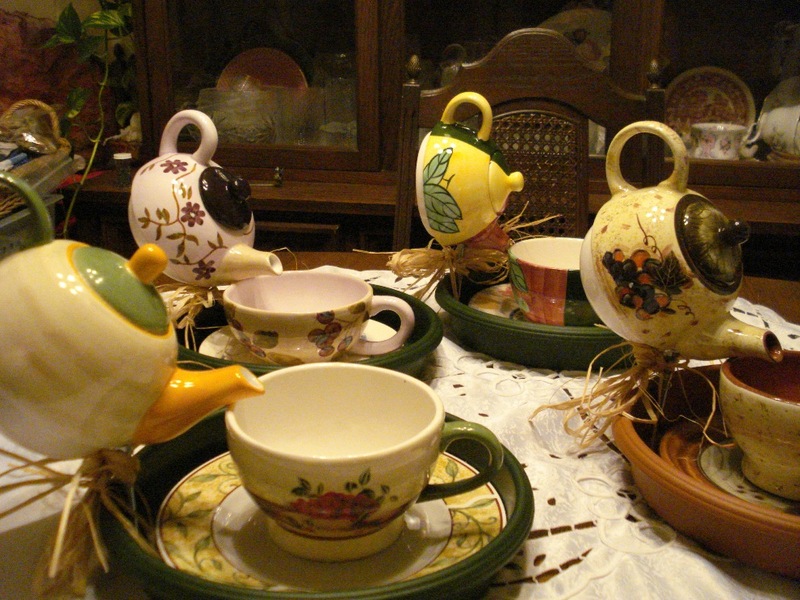 This was such a fun project I am so going to be making more…drilling more teapots…teacups… hide your Royal Daulton ladies cuz mama’s got her drill in hand! Isn’t it adorable? I’m not sure what I’ll do with this one but its almost too pretty to put outdoors. I may take it across the lake next weekend and set it into my wheelbarrow of flowers. I still have to seal the spout to keep the bugs and wasps out. The cup is large and I can put birdseed into it. Don’t you think it would be so cute to have the little birdies sitting on the cup eating? Thank you Glenda for a new project…have a look at her site and see her lovely flowers. So they sit together in a new found spot. I’ll show you the little white pear salt shaker another time. Its really neat. 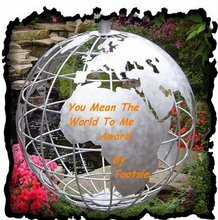 I’ve found a lovely blog called tootsietime that belongs to Glenda from Alberta, Canada. She has a beautiful garden and she gives a great tutorial for making a garden ornament out of a teacup and teapot. I loved it. So I also found this tea set (its the teapot that sits on a large cup) and I found the saucer separately . I hope it won’t break when I try to drill into them. Tomorrow the love bunny is going to Las Vegas to meet his son who lives in Hawaii. It will be a guy’s weekend that will last until Wednesday. I’m home this weekend therefore and will watch my granddaughter on Saturday evening. The rest of the time so far is my own so I’ll see what I can catch up on. Today I’m sewing my geisha bag….I have a lap quilt to finish up…and all kinds of things I want to start to do, including Glenda’s garden tea party project. I hope by the end of the weekend I’ll be able to show you some of my fruits of labour. I will be disappointed with me if I don’t. 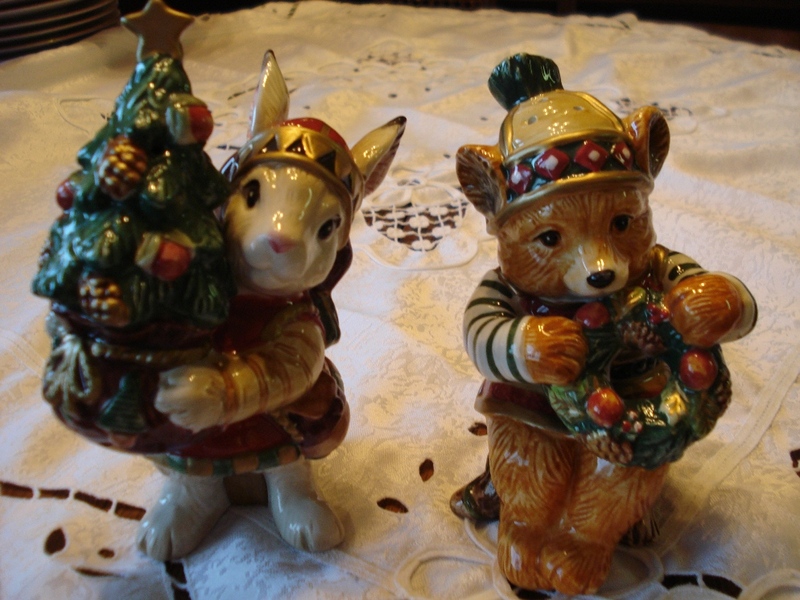 I am sharing another Fitz and Floyd salt and pepper shaker set I adore. One of them is a bunny and I love bunnies. It isn’t the right season for this set but here it is anyway. I had admired it for some time in the stores and a few years ago while the love bunny and I were in Houston right after Christmas I found it for a steal on clearance! Do you collect Fitz and Floyd pieces? Is there something that you absolutely love to collect in F&F or something else?